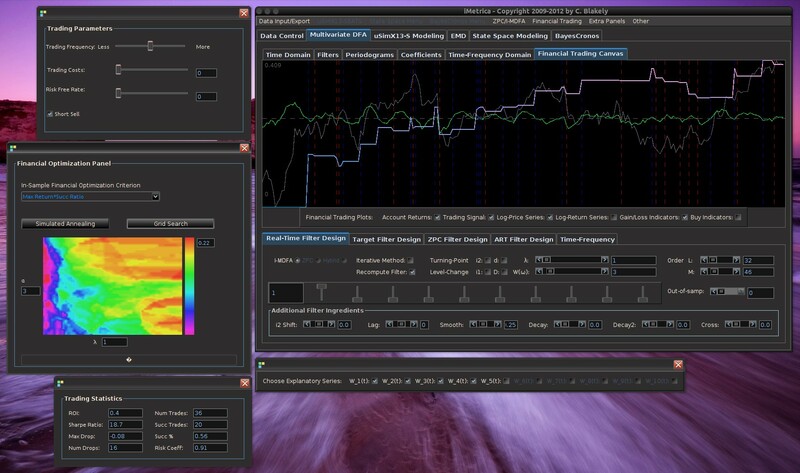 The high-frequency Financial Trading interface of iMetrica. Easily construct in-sample trading strategies with an array of optimizers unique to iMetrica and then employ the strategies out-of-sample to test and fine-tune the trading performance. This blog serves as an introduction and tutorial to Hybridometrics using iMetrica. Hybridometrics is a term used to express the analysis, modeling, signal extraction, and forecasting of univariate and multivariate financial and economic time series data using a combination of model-based and non-model-based methodologies. Ideal combinations of computational paradigms and methodologies used in hybridometrics include, but are not limited to, traditional stochastic models such as (S)ARIMA models, GARCH models, and multivariate stochastic volatiluty models combined with empirical mode decomposition techniques and the multivariate direct filter approach (MDFA). The goal of hybridometric modeling is to obtain signal extractions and forecasts, for official use or government use, all the way to building high-frequency financial trading strategies, that perform better than using only model or non-model based methods alone. In other words, hybridometrics seeks to extract the advantages of different paradigms combined to outperform traditional approaches to time series modeling. The iMetrica software package offers the most versatile and computationally efficient portal to this newly proposed time series modeling paradigm, all while remaining surprisingly easy to use. The iMetrica software package is a unique system of econometric and financial trading tools that focuses on speed, user interaction, visualization tools, and point-and-click simplicity in building models for time series data of all types. Written entirely in GNU C and Fortran with a rich interactive interface written in Java, the iMetrica software offers an abundance of econometric tools for signal extraction and forecasting in multivariate time series that are both easily accessible with the click of a mouse button and fast with results computed and plotted instantaneously without the need for creating output data files or calling exterior plotting devices. One powerful feature that is unique to the iMetrica software is the innate capability of easily combining both model-based and non-model based methodologies for designing data forecasts, signal extraction filters, or high-frequency financial trading strategies. Furthermore, the strategies can be computed and tested both in-sample and out-of-sample using an easy to use built-in data partitioner that effectively partitions the data into an in-sample storage where models and filters are computed and then an out-of-sample storage where new data is applied to the in-sample strategy to test for robustness, over-fitting, and many other desired properties. This gives the user complete liberty in creating a fast and efficient test-bed for implementing signal extractions, forecasting regimes, or financial trading strategies. The iMetrica software environment includes five interacting time series analysis modules for building hybrid forecasts, signal extractions, and trading strategies. uSimX13 – A computational environment for univariate seasonal auto-regressive integrated moving-average (SARIMA) modeling and simulation using X-13ARIMA-SEATS. Features an interactive approach to modeling seasonal economic time series with SARIMA models and automatic outlier detection, trading day, and holiday regressor effects. Also includes a suite of model comparison tools using both modern and goodness-of-fit signal extraction diagnostics. BayesCronos – An interactive time series module for signal extraction and forecasting of multivariate economic and financial time series focusing on Bayesian computation and simulation. This module includes a multitude of models including ARIMA, GARCH, EGARCH, Stochastic Volatility, Multivariate Factor Stochastic Volatility, Dynamic Factor, and Multivariate High-Frequency-Based Volatility (HEAVY), with more models continuously being added. For most of the models featured, one can compute the Bayesian and/or the Quasi-Maximum-Likelihood estimated model fits using either a Metropolis-Hastings Monte Carlo Markov Chain approach (Bayesian) or a QMLE formulation for computing the model parameters estimates. Using a convenient model selection panel interface, complete access to model-type, model parameter dimensions, prior distribution parameters is seamlessly available. In the case of Bayesian estimation, one has complete control over the prior distributions of the model parameters and offers interactive visualization of the Monte Carlo Markov Chain parameter samples. For each model, up to 10 sample 36-steps ahead forecasts can be produced and visualized instantaneously along with other important model features such as model residuals, computed volatility, forecasted volatility, factor models, and more. The results can then be easily exported to other modules in iMetrica for additional filtering and/or modeling. MDFA – An interactive interface to the most comprehensive multivariate real-time direct filter analysis and computation environment in the world. Build real-time filters using both I-MDFA and Zero-Pole Combination (ZPC) filter constructions. The module includes interactive access to timeliness, smoothing, and accuracy controls for filter customization along with parameters for filter regularization to control overfitting. More advanced features include an interface for building adaptive filters, and many controls for filter optimization, customization, data forecasting, and target filter construction. State Space Modeling – A module for building observed component ARIMA and regression models for univariate economic time series. Similar to the uSimX13 module, the State Space Modeling environment focuses on modeling and forecasting economic time series data, but with much more generality than SARIMA models. An aggregation of observed stochastic components in the form of ARIMA models are stipulated for the time series data (for example trend + seasonal + irregular) and then regression components to model outliers, holiday, and trading day effects are added to the stochastic components giving ultimate flexibility in model building. The module uses regCMPNT, a suite of Fortran code written at the US Census Bureau, for the maximum likelihood and Kalman filter computational routines. EMD – The EMD module offers a time-frequency decomposition environment for the time-frequency analysis of time series data. The module offers both the original empirical mode decomposition technique of Huan et al. using cubic splines, along with an adaptive approach using reproducing kernels and direct-filtering. This empirical decomposition technique decomposes nonlinear and nonstationary time series into amplitude modulated and frequency modulated (AM-FM) components and then computes the intrinsic phase and instantaneous frequency components from the FM components. All plots of the components as well as the time-frequency heat maps are generated instantaneously. Along with these modules, there is also a data control module that handles all aspects of time series data input and export. Within this main data control hub, one can import multivariate time series data from a multitude of file formats, as well as download financial time series data directly from Yahoo! finance or another source such as Reuters for higher-frequency financial data. Once the data is loaded, the data can be normalized, scaled, demeaned, and/or log-transformed with a simple slider and button controls, with the effects being plotted on the graphic canvas instantaneously. Another great feature of the iMetrica software is the ability to learn more about time series modeling through the using of data simulators. The data control module includes an array of data simulating panels for simulating data from a multitude of both univariate and multivariate time series models. With access to control the number of observations, the random seed for the innovation process, the innovation process distribution, and the model parameters, simulated data can be constructed for any type of economic or financial time time series imaginable. The different types of models include (S)ARIMA models, GARCH models, correlated cycle models, trend models, multivariate factor stochastic volatility models, and HEAVY models. From simulating data and toggling the parameters, one can visualize instantly the effects of the each parameter on the simulated data. The data can then be exported to any of the modules for practicing and honing one’s skills in hybrid modeling, signal extraction, and forecasting. Keep visiting this blog frequently for continuous updates, tutorials, and proposals in the field of econometrics, signal extraction, forecasting, and high-frequency financial trading. using hybridometrics and iMetrica. This entry was posted in Forecasting, iMetrica and tagged econometrics, financial trading, signal extraction, software. Bookmark the permalink.